The thyroid gland is part of the endocrine system and is located at the base of the neck in the front. (See Figure 1) It has two lobes and sort of wraps around the trachea (windpipe) The thyroid regulates metabolism, weight gain or loss, heart rate, how blood sugar is used and plays a large part in the reproductive system. It also has an effect on the digestion of food, body temperature, cognitive function and memory. What are thyroid hormone levels? 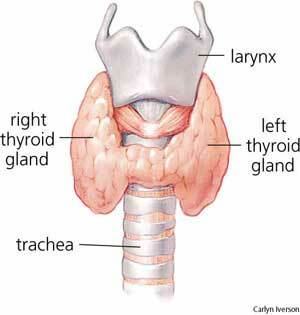 The thyroid gland produces a hormone called thyroxine. Iodine plays a very large role in this production and it is very common in countries that do not used Iodized salt to have lower thyroid hormone levels and thyroid disease. The thyroid produces and stores thyroxine and then releases it as the body needs it. There is another hormone produced in the brain called TSH (thyroxine stimulating hormone) that tells the thyroid when to release the hormone. This is where is gets tricky; when the thyroid is not releasing enough thyroid hormone the TSH level goes up. When the thyroid is releasing enough hormones the TSH level goes down. One triggers the other. T4 is the name for thyroxine. T3 is the secondary hormone that the body converts thyroxine into for actual use by the body. This is the hormone that gives us energy and regulates all of the metabolic processes. Sometimes, these hormones are bound by proteins in the blood and it is too hard to get true levels that are reaching the tissues. The most accurate tests for true levels of T3 and T4 in the blood are the Free T3 and Free T4, which are un-bound by proteins. Most often doctors only run a TSH. If this level is high, then the body needs more thyroid hormone. The TSH level should be between 0.5 and 4.5/5.0 according to the current guidelines; however thyroid advocates are calling for those ranges to be lowered. There may be symptoms and evidence of low thyroid hormone in people whose TSH is between 2.0 and 3.0. What are the symptoms of low thyroid levels? The symptoms may come on over a period of time and could take months or even years to fully develop low enough levels for treatment. But there are some natural remedies to help mild cases of low thyroid levels. Just remember that if you are on thyroid replacement therapy, talk to your doctor before using any supplements. What are some natural ways to increase thyroid hormone levels? Iodized and Sea Salt with Minerals Make sure that you are using iodized salt in your home and for an extra punch, try sea salt with minerals. These help to nourish the thyroid gland and help it step up production of hormone. (See Figure 3) The best type of sea salt is Celtic sea salt and the greyer the color the better. This means there is an abundance of minerals present. Avoid Soy Soybeans mimic thyroid hormone and can make your body think there is enough there, when actually there is not enough. Soy in large amounts can be harmful to the thyroid gland. Take Spirulina These little guys from the ocean are nutrient rich with iodine and other minerals that are good for your thyroid. Get Enough Minerals Your thyroid needs zinc, magnesium, selenium and copper in order to convert T4 into the active form T3. Avoid Broccoli and Cauliflower Any of the cruciferous vegetables can block the action of thyroid hormone in the body. Limit these vegetables to a few times a month if you have problems with thyroid hormone levels. Try Yoga Poses like the shoulder stand and halasana can help to increase the blood flow to the thyroid. Even just increasing regular exercise can help to increase your body’s sensitivity to the thyroid hormone already present in the body. Licorice Root Can help to boost function of all the endocrine glands and increase energy. Use caution with licorice if you suffer from high blood pressure. Try Gluten-Free If you have an auto-immune disease of the thyroid, some people notice a large improvement with eliminating gluten from the diet. The good news is if you suffer from a “sub-clinical” hypothyroidism and your levels are near the normal range, you can do something to improve its function. Just make sure to let your doctor know if you are using any supplements to boost the thyroid to avoid any interactions. With proper diet, exercise and adding minerals you can have a healthy thyroid!